Yamabiko Europe is a Belgian company and is a member of Yamabiko. Based in Japan, Yamabiko is a global company with major markets in Japan and the Americas and a growing business presence in Europe, Asia, and other countries. Yamabiko manufactures and sells Outdoor Power Equipment, Agricultural machinery and Industrial machinery. Yamabiko is listed on the Tokyo Stock Exchange. More information can be found at www.yamabiko-corp.co.jp/english/. 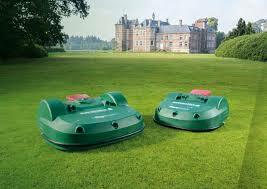 • Robotic mowers and golf ball pickers: YE is the world leader in commercial-scale automatic lawn mowers for large areas: we design, manufacture and sell robot mowers for turf areas up to 20,000 m2 and automatic ball pickers that collect golf balls on practices. Belrobotics and Echorobotics robots are currently used across Europe to maintain sports facilities (football, rugby, golf courses), private gardens and large open spaces. More information can be found at www.belrobotics.com and www.echorobotics.com. As a full-fledged Yamabiko Group company, we will intensify our reach in Europe, and start distributing our products and applications in North America and Asia. • Outdoor Power Equipment (OPE): YE’s OPE Department is dedicated to promoting ECHO and SHINDAIWA products across Europe, Africa and Middle East. These products include chain saws for limbing, felling, and pruning trees: trimmers and brushcutters for grass cutting, mowing and clearing, and power blowers for blowing, collecting, and shredding leaves and debris. As from January 2019, YE will become the full-pledged distributor arm of Yamabiko OPE products across Europe and Africa, taking responsibility for sales and profits. In order to improve the digital presence of its services and products delivered to its customers, YE is looking for a Digital & Communication Coordinator. o Extranets containing the marketing and technical information. o Social media: Facebook, Youtube, LinkedIn and other. o Content marketing with blog posts and testimonials. • Support an eCommerce strategy for distributors and dealers. • Manage the production of marketing and technical videos and photos. • Support the organisation of international fairs and exhibition. • Coordinate of the technical and marketing translations of marketing supports and technical manuals with specialized translation agencies. • Broadcast marketing and technical updates towards partners and end-users. • You have a bachelor’s degree in either e-business, digital communication or marketing; or equivalent professional experience. • You are fascinated by the digital world: it is part of your DNA and you inspire others to adhere. You combine a strategic and tactical, pragmatic approach. • You have a good understanding of product and software development processes. • You can work autonomously. • You look for added value towards internal and external stakeholders. You have a very strong feeling of the customer’s needs and behaviours. • You have strong analytical and communication skills. You have strong influencing, facilitating and federating skills. • You are creative and agile in your approach. You are a team player and can work in a multi-cultural environment. • Colleagues working at a high level of expertise, who enjoy a nice working atmosphere and together strive to achieve ambitious objectives. • The Yamabiko Group offers a large number of opportunities and challenges in fast growing robotic markets. • An open working environment and a permanent contract with a competitive salary package and fringe benefits. You will be based in Wavre, Belgium (25 km South East of Brussels). You will take periodical travels in Europe and Japan.